As the global economy regains its strength and the middle classes in developing economies expand, sales of luxury goods and experiences are on the rise. The 16th edition of Bain & Company's 'Luxury Goods Worldwide Market Study' found that the global luxury market is estimated to have grown to almost EUR1.2 trillion (USD 1.4 trillion) in 2017 - a 5% increase over the previous year. This is promising news for the luxury industry - let's take a look at five key trends that are shaping the market. Bain & Company tracks nine segments across the global luxury market - personal luxury goods, luxury cars, luxury hospitality, luxury cruises, designer furniture, fine food, fine wines and spirits, private jets and yachts, and fine art - of which luxury cars, hospitality, and personal goods account for more than 80%. Luxury cars is the most significant segment by size, growing 6% in 2017 to EUR489 billion (USD 571 billion). 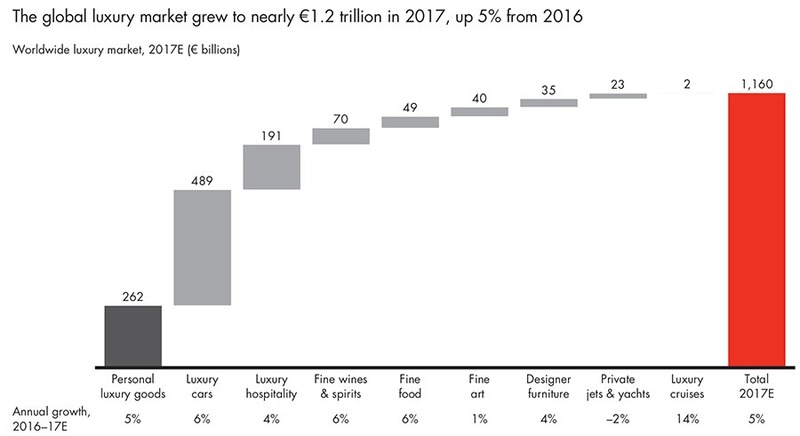 Personal luxury goods claim the second spot at EUR262 billion (USD 306 billion), up 5%, with luxury hospitality taking third, coming in at EUR191 billion (USD 223 billion), a 4% increase. Luxury cruises saw the fastest level of growth - up 14% - though remains the smallest segment at EUR2 billion (USD 2.34 billion). The only segment to see a decline was private jets and yachts - down 2% to EUR23 billion (USD 26 billion). The luxury personal goods market experienced growth across all regions. Europe saw the most significant increase at 7%, taking the top spot from the Americas to claim the largest share of the global market - 33% vs. 32%. 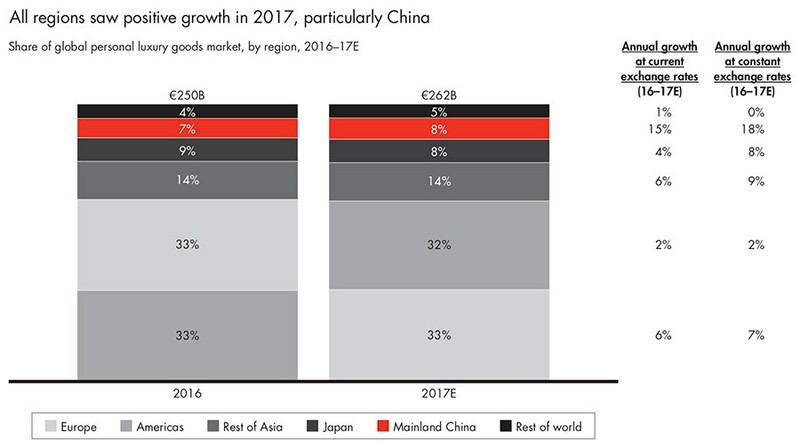 China, however, was the year's top performer, increasing its share of the market from 7% in 2016 to 8% in 2017, with growth up at 18% - the most significant level of growth by far. Fueled by renewed customer confidence and the rapidly emerging and fashion-conscious middle class, local buying by Chinese customers boosted sales in mainland China by 15%, making it a crucial EUR20 billion (USD 23 billion) market for luxury brands. More and more luxury sales are taking place online and could make a significant impact on physical store sales in the longer term. Luxury online sales jumped 24% in 2017, reaching an overall market share of 9%. Bain estimates that by 2025, online sales of personal luxury goods will make up 25% of the total market. 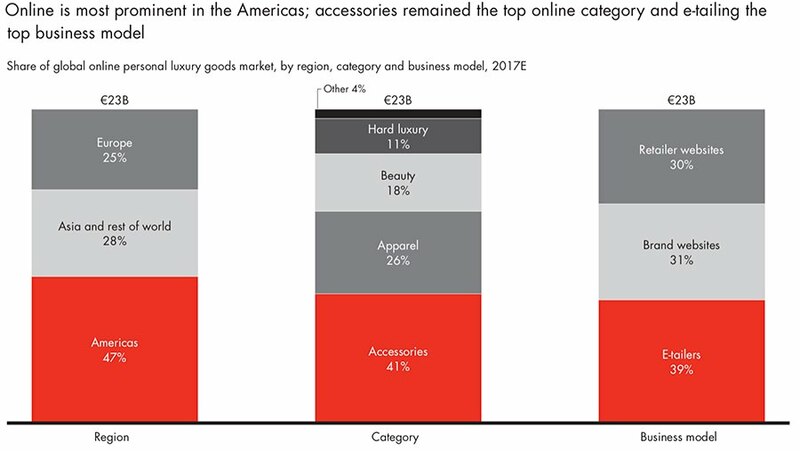 Online options are most frequently used for accessories (41%), apparel (26%), and beauty items (18%). The Americas took the largest share of online sales at 47%, followed by Asia and the Rest of the World at 28%, and Europe at 25%. "With the remarkable growth of the online channel, the role of physical stores will need to change," writes Bain. "Stores haven't lost their purpose, but brands need to reinvent them to better engage with customers, in a way that transcends channels. Stores will have to pivot from a transactional role to become venues for a broader range of customer interactions. Luxury brands have grown accustomed to presenting a monologue about themselves in stores that feel like temples. Increasingly, they will need to transform stores into places that feel like home, delivering distinctive, immersive experiences and engaging in a genuine dialogue with customers." Millennial (Gen Y) and Gen Z consumers are proving to be the main growth engine in the luxury market, accounting for 30% of luxury sales, yet fueling a massive 85% of all growth in 2017. But the younger generations are also reshaping what "luxury" is, thereby what luxury brands need to do to appeal to them. While previous generations purchased luxury items to signify social status, class, and accomplishments, the millennial generation has a different set of values. For them, such achievements aren't as significant. Luxury items are more about self-expression and defining who they are. For example, luxury apparel brands are reinterpreting streetwear - and even collaborating with streetwear brands and artists - to appeal to younger customers. As Oliver Abtan, Partner and Managing Director at The Boston Consulting Group, puts it: "Collaboration covers demand for newness in a less risky way. It gives brands a cool edge and strengthens brand awareness as well as increases willingness to buy the brand. Collaboration is increasingly in demand and turns out to be a very effective purchasing incentive." In a separate study, Mindshare North America surveyed 1,600 luxury adult shoppers in the US to define how luxury is changing. "The definition and perceptions around luxury have changed a great deal over the years and brands need to understand the nuances to succeed," said Mark Potts, Head of Insights at Mindshare North America. "While there are certain fundamental and immutable human motivations around luxury, our research shows that consumers' luxury behaviors are shifting due to everything from changing demographics to evolved values and priorities to new influencers." Strivers: This category makes up 24%, and consists of consumers who see "luxury as reflective of success". 57% of Strivers are millennials, 58% are male, and 34% identify themselves with an ethnicity other than white. At present, Strivers are mostly middle to upper middle class because they are still early in their careers, but will eventually work their way into the more elite income brackets. Only the Best: This is the second-largest group, making up 23% of luxury consumers. This cohort views luxury as "unsurpassed quality and service", and are generally older than Strivers - 26% are 65 or older, and 41% are between 45 and 64. 28% of this group have annual household incomes (HHI) of $150,000 or above, 27% make between $100,000 and $149,000, and 26% have incomes of $75,000 to $99,000. Comfort First: The next largest group regard luxury as a "meaningful way of life", and contains the biggest percentage of consumers aged 65 and over - 42%. Only 9% of Comfort First consumers are millennials. This group also has the highest percentage of white consumers - 81%. More than one third (35%) have annual household incomes of $150,000 or higher. Aesthetes: Aesthetes define luxury as "the pinnacle of aesthetics and design" and make up 17% of luxury consumers. 62% of this cohort are female. 21% are between the ages of 45 and 54, 20% are 35 to 44, and 20% are 65 or older. Aesthetes tend to be high earners - 33% have an annual HHI of $100,000 to $150,000, with 28% earning $150,000 or above. Trendsetters: This is the smallest group, representing 16% of luxury consumers. Trendsetters are defined as those who "use luxury to stand out". 46% are under the age of 34, and 40% identify themselves with an ethnicity other than white. This group also has the highest percentage of consumers from the southern parts of the US - 36%. "There are different reasons people buy luxury," said Paul Bloom, Professor of Psychology at Yale University, who Mindshare North America consulted with on the research. "One is pure aesthetics. Some things are just more joyous to look at, to smell, to taste. Another is signaling - we sometimes buy luxury items to show things to other people, and what we're trying to show is a really complicated question. And third is the idea of essentialism - we're not just sensitive to how things look, but to beliefs about their creation. Some luxury items resonate not merely because of aesthetics, or signaling, but because pleasure's deep."